Senlis is a commune in the Oise department in northern France. It has a long and rich heritage, having traversed centuries of history. This medieval town has welcomed some of the most renowned figures in French history, including Hugh Capet, Louis IX, the Marshal of France, Anne of Kiev and Séraphine de Senlis. The monarchs of the early French dynasties lived here, attracted by the proximity of the Chantilly forest. It is renowned for the gothic Senlis Cathedral and its vast historical monuments.Its habitants are called "Senlisiens" and "Senlisiennes". Senlis is part of the province of l'Oise in the region of Picardy in the north of France. It is situated on the river Nonette, between the forests of Chantilly and d'Ermenonville in the South and d'Halatte on the North. It is located 40 kilometers from the north of Paris, 44 km from Beauvais and 79 km from Amiens. The highest point of the town (140m) lies at the heart of the forest Halatte and the lowest point is located on the banks of the Nonette, west of the city. Geologically, the area is occupied by a vast limestone plateau of the Lutetian covered mostly in silt. Senlis was known in early Roman imperial times as Augustomagus and later as Civitas Silvanectium ("City of the Silvanectes"). During the 3rd century, a seven-meter high defensive wall, about half of which still exists, was erected around the settlement in response to Frankish incursions. The wall remained in use into the 13th century. The town also featured a Roman amphitheatre, the remains of which are still visible, about 500 m west of the walled town. The amphitheatre seated as many as 10,000 people and was used for public meetings, theatre, gladiatorial combats, and animal hunts. The monarchs of the early French dynasties lived here, attracted by the proximity of the Chantilly Forest and its venison, and built a castle on the foundations of the Roman settlement. In 987 the archbishop of Reims, Albéron called together an assembly, and asked them to choose Hugh Capet as king of France. However, the monarchs of France soon abandoned the city, preferring Compiègne and Fontainebleau. New life was given to the city in the 12th century, and ramparts were built. The popularity of the city later fell, and it slipped into decline. Today it remains an attraction for tourists for its long history and its links to the French monarchy. Senlis fell under the ownership of Hugh Capet in 981. He was elected king by his barons in 987 before being crowned at Noyon. Under the Capetian rule, Senlis became a royal city and remained so until the reign of Charles X. A castle was built during this period whose remains still lie today. The city reached its apogee in the 12th and 13th centuries as trade of wool and leather increased, while vineyards began to grow. With an increasing population, the city expanded and required the construction of new ramparts: a second chamber was erected under Phillip II that was larger and higher than the ramparts of the Gallo-Romans. A municipal charter was granted to the town in 1173 by the King Louis VII. The bishop of Senlis and the Chancellor Guérin became close advisors to the King, strengthening Senlis' ties to the French royalty. In 1265, the Bailiwick of Senlis was created with its vast territory covering the Beauvais and the French Vexin. In 1319, the town crippled by debt, was passed to the control of the royalty. Senlis became devastated by the Hundred Years' War, but managed to escape destruction despite being besieged by the Armagnacs. Senlis' economy suffered heavily and would have to wait until the 15th century to observe another boom, during which many buildings were built or restored. In 1493, the King Charles VIII of France, son of Louis XI signed the Treaty of Senlis with the Duke of Burgundy, Maximilian I of Austria. The Senlis Cathedral is a Roman Catholic Gothic church and a national monument of France. 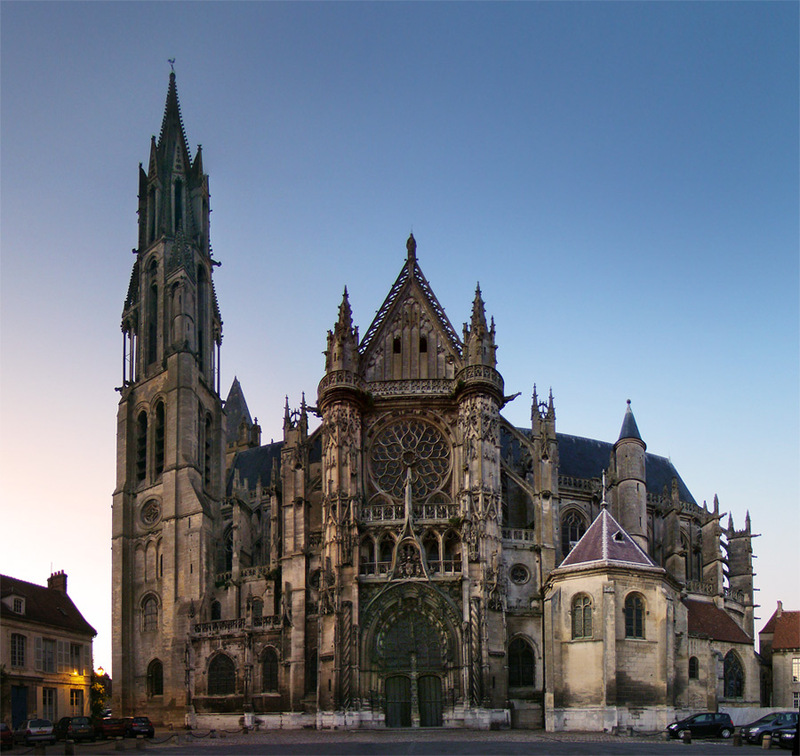 The Cathedral was the ancient seat of the Bishopric of Senlis, abolished by the Concordat of 1801, when its territory was passed to the Roman Catholic Diocese of Beauvais. The southern portal of the 16th century, the works of Martin Chambiges, marked the evolution of Gothic art. 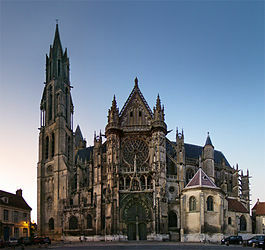 The cathedral was built between 1153 and 1519; its 256-foot-tall (78 m) tall spire dates from the 13th century and is visible across the plain of Valois. Its transepts were rebuilt between 1530 and 1556 after being destroyed by a fire, while the side portals and shallow east chapels date from about the same period. The Ancient Royal Castle- priory Saint Maurice. The site has been occupied since the Roman era. In the course of the 4th century, the site was visited by the Carolingian kings. The actual castle dates back from the 12th century under Louis VII of France. Hôtel de Ville Senlis has a plaque attached to honor the loyalty of Henry IV of France. The former St. Vincent Abbey was founded in 1065 by Queen Anne of Kiev and entrusted to the canons regular of the Abbey of St Genevieve in Paris, known as Génovéfains. The complex was transformed into a boys boarding school by the Marist Fathers in the 19th century and still exists today. The Museum of Art and Archeology contains notably rings found in a Roman- Gaul temple in the forest of d'Halatte. It is currently closed for renovation. In 1972, the September meetings were created as cultural manifestation making Senlis a pedestrian town for a weekend in September. The event allows the public to discover the gardens and particular hotel hidden behind doorways. The last gathering took place in 2007. The Garden Lounge takes place around April, along with the Christmas march that take place around the Church of Saint Peter. In A Writer at War 14-18, Édouard Coeurdevey describes the German destruction that he witnesses when visiting Senlis on 6 June 1915. On June 8 he wrote 'Senlis bonde d'Annamites'. ^ a b Athena Review, Vol.4, No.2. "The Roman Wall of Senlis". http://www.athenapub.com/14senlis-wall.htm. ^ Bruce Klee (December 1975). "Three Gallo-Roman Multi-Purpose Theatres". JSTOR. pp. 516–520. ^ "Publication de la paix de Senlis". Manuscrits de l'Institut de France. 23 May 1493. http://www.calames.abes.fr/pub/#details?id=IF1D11136. ^ "Polémique autour des Rendez-Vous de septembre". Le Parisien. 14 January 2009. http://www.leparisien.fr/senlis-60300/polemique-autour-des-rendez-vous-de-septembre-14-01-2009-372317.php. ^ Édouard Coeurdevey. Carnets de guerre. pp. 14–18. http://fr.wikipedia.org/wiki/Collection_Terre_humaine. ^ Michel Lalande (1997). "Liste de tournages sur le site". p. 125. http://www.l2tc.com/cherche.php?exact=oui&pays=fr&reget=Picardie&dept=Oise&nodept=60&ville=Senlis. This article incorporates information from the equivalent article on the French Wikipedia. This page uses content from the English language Wikipedia. The original content was at Senlis. The list of authors can be seen in the page history. As with this Familypedia wiki, the content of Wikipedia is available under the Creative Commons License.